In 1961, Jack Currey, founder of Western River Expeditions received a trainload of rubber. The problem? It wasn't what he ordered. Using his famous ingenuity, he crafted the "J-Rig," named after "Jack." This patented craft is used exclusively by Western River Expeditions and offers the most flexible and comfortable ride on the river. 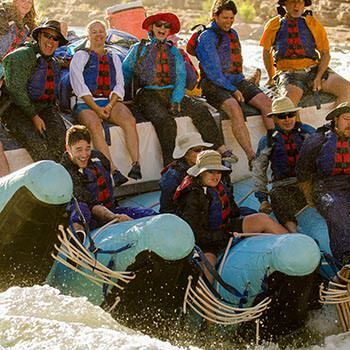 Where the Colorado River carves through Cataract Canyon earlier in the summer and on our Grand Canyon rafting trips, J-Rigs are the vessel of choice for maximum excitement and safety. Environmentally friendly, quiet 4-stroke motors power these rugged rafts specially built for Western. "Your J-Rig and all of the equipment you supplied were top quality. The design of your J-Rig provided both maximum comfort for the less adventuresome and exhilarating thrills for the white water fans."